I sometimes think you're dumber than Cannuck! That's what they are hoping anyway! Moderate Republican can't beat a weak Democrat opponent. Trump's definitely doing some damage. This would have been a slam dunk for the Republicans two years ago. Lee Carter, a Democratic Socialist candidate for the Virginia House of Delegates, who was largely written off by the Democratic Party, has just won his election in the state’s 50th district. Carter, an IT specialist and veteran , defeated incumbent Republican delegate and House Majority Whip Jackson Miller by around 10 percentage points , in an election many thought was an easy race for the GOP candidate. Carter is a member of Democratic Socialists of America, a movement of leftist Americans that has seen precipitous growth since the 2016 election. Hillary Clinton beat Donald Trump by nearly 13 points in Carter’s northern Virginia district in 2016, yet Carter reportedly received few resources from the state’s Democratic Party. But the local chapters of DSA helped organize a grassroots effort to sweep Carter into office, and it appears to have paid off. In addition, organizations like Forward Majority, a progressive group that invests in under-resourced state legislative races, helped support Carter’s victory. Last night seems to have been a good swift kick to the scrotum to all the Trumpites. Good to see how a bernie person would do in an election when not having the election stolen by hillary and her little boy beatches. Certainly the same can be said about the Alt-Left media regarding all of the Special Elections that the Republicans won earlier this year. Each one was a strong message to Trump if the Democrats won. When they lost each and every one of them the liberals said they really weren't that important, they were all Red States anyhow. I never get tired of winning. Your fuhrer lied to you. You're supposed to be tired by now. I guess he didn't know that some people do not get tired of winning no matter how much winning there is. He's not perfect... he's just the President of the United States. I guess he didn't know that.. He's the President though. One year ago today he sent all you libs reeling. You've not been the same since. One year ago today he sent all you libs reeling. I wouldn't take too much from state elections where local issues predominate. These were not a plebiscite on Trump. Trump's real measure of success will be to move the political equilibrium towards a nationalist and populist centre.. for BOTH parties.. and away from the free market economic ideology and amoral humanist agendas that dominate the Establishments the Repubs and the Dems. Trump will win a second term if he keeps his promises in dismantling global free trade, appointing moral candidates to the USSC, reestablishing respect for borders and laws, investing in infrastructure, providing sound economic management. What's more he'll likely develop alliances with populist politicians from both parties to implement that agenda. 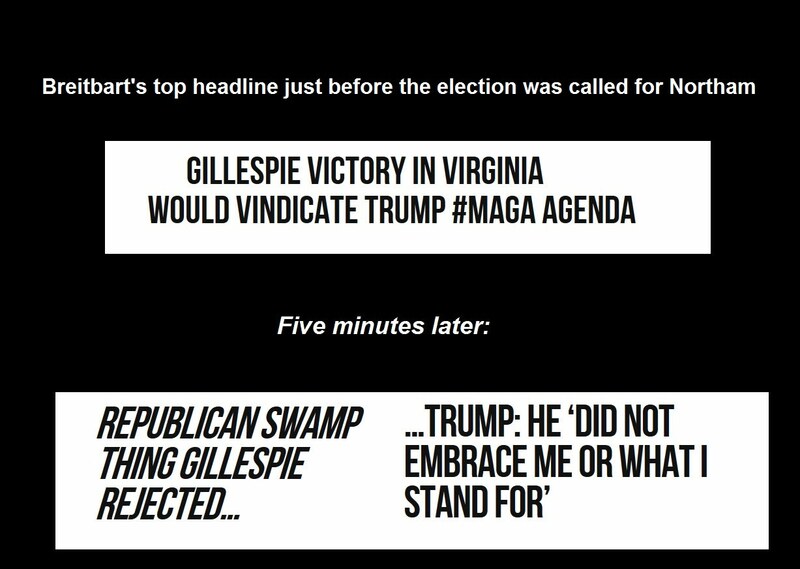 Last edited by coldstream; Nov 8th, 2017 at 01:54 PM..
Before this election, Virginia had been at the mercy of WINVote, a brand of electronic servers described by Wired as "America's worst voting machines." They were filled with bugs upon their debut in 2003, when they subtracted one out of every hundred votes cast and caused Rita Thompson to lose her local school board election by a close margin, and never improved throughout their decade of usage. Thanks to their easy passwords (one of them was, I kid you not, "abcde"), lack of security, and reliance on wi-fi to work, they were a boon for hackers who could crack the system's WEP key in under three minutes to insert their malware. Aided by WINVote's lack of internal logging capabilities or paper trail, there was even built in plausible deniability that any hacking had occurred.